литий-полимерн., 2840 mAh, время разговора в сети 2G (сведения производителя): 25.4 час., время разговора в сети 3G (сведения производителя): 21.7 час., время ожидания в сети 2G (сведения производителя): 391 час., время ожидания в сети 3G (сведения производителя): 402 час. Microevolution. HTC only changed a few things about the tried-and-true look of their top-of-the-line One M9. Instead they made significant improvements to the cameras and installed a modern Snapdragon 810 into the smartphone. In a rush of bold self-confidence, they also raised the recommended retail price. We don’t mind that HTC has only lightly changed the casing of the One M9 - it is a strength of the One series after all. What’s more unforgivable is that the camera and battery life are so mediocre. Performance, screen and build quality are up to scratch, but many other phones also share these advantages. We don’t mind that HTC has only lightly changed the casing of the One M9 - it is a strength of the One series after all. What’s more unforgivable is that the camera and battery life are so mediocre. Performance, screen and build quality are up to scratch, but many other phones also share these advantages. Unless looks are everything, you can get better elsewhere.. Pro: edles Design und großartige Verarbeitung; Spritzwasserschutz; microSD-Kartenslot; höherauflösende Kamera ... schlanke und flotte Sense-7.0-Oberfläche mit Theme-Support. Contra: ausgeprägtere Drosselung der CPU bei Dauerlast; 20-Megapixel-Hauptkamera nicht auf dem Niveau der Konkurrenz; vergleichsweise kürzere Akkulaufzeit; vergleichsweise teuer. Overall the M9's focus on manufacturing precision feels like something of a distraction: were smartphone fans demanding increasing precision in manufacture, or were they calling for better battery life and an improved camera experience? As pretty as it is, the HTC One M9 doesn't feel like it's taken a big enough step forward. 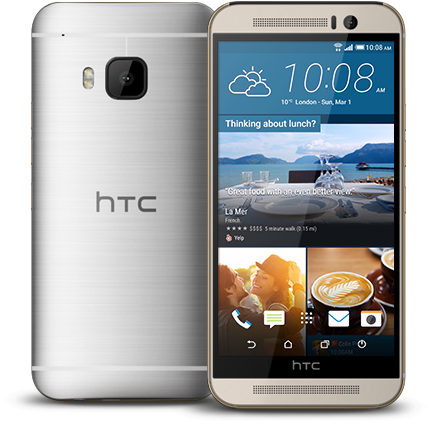 The HTC One M9 offers some smart upgrades, but struggles with consistency and performance in some areas. Its battery life is disappointing and the camera is not as reliable as most competitors. This remains a great phone, and its aluminium body is among the most expensive-feeling of any mainstream phone to date. The only thing the HTC One M9+ has over its competitors is its looks and build, which is not enough to shell out 50k for this device. If you're going to spend this kind of money for a flagship device, there's a better performer in the Galaxy S6. Featuring a better display, infinitely superior camera, longer battery life and costing £80 less, the LG G4 is the clear winner of this vs review. That said, it's worth noting that the One M9 is still far from terrible and features a more premium, robust metal design and higher maximum storage capacity. Samsung Galaxy S6 vs HTC One M9 comparison review: Which is the best new phone for 2015? HTC has launched some of the prettiest Android phones, but Samsung has turned things around with its slender all metal and glass, Quad HD Samsung Galaxy S6. With a better screen and camera plus extras such as a fingerprint scanner, heart-rate monitor and wireless charging it's worth paying the extra for. The standout downside here is the lack of a microSD card slot. On specs alone it's a close call between HTC One M9 and LG G4. The HTC is in our opinion the better-looking of the pair, and performance should be better, yet the LG G4 offers great value at £499 and boasts a significantly better screen if you want to watch media and play games. We'll offer a definitive verdict once we've finished benchmarking the LG G4. Still, if none of this bothers you, then the HTC One M9 is still a decent buy that stands to be much more wallet-friendly than either of Samsung's new phones over the next few months. As it stands now, the HTC One M9 is a powerful and attractive flagship Android phone, but the issues with the camera and the quality of the screen hold it back. Sounds like I like the One M9, doesn’t it? I do. The problem is, I don’t like it enough. The One M9 has been — over the course of a few days — like a good first date where there was just no chemistry. I got on fine with the handset, and I like what it had to show me, but it’s just not special enough. So yeah, you probably don’t want this phone. It’s heavy, awkward to use, has a pretty poorly put together design, an unimpressive display and camera, less-than-average battery life, and doesn’t include any sort of game-changing or lust-worthy features that other smartphones don’t already have. HTC played it safe and still managed to screw up. Think about that for a minute. I missed Mobile World Congress this year so this was the first time I got hands on the M9. Overall I was impressed but wasn’t quite blown away for what is a flagship phone. It is hard to improve on the already great hardware HTC had on the M7 and M8, but to me it felt like something was lacking here. Maybe it was the 1080p screen whereas others are getting 2K now, it is hard to really pinpoint it, I was just expecting a little more. HTC One M9 vs One M9+ comparison preview: What's the difference? 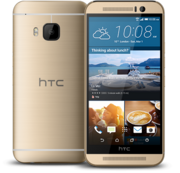 Although the HTC One M9+ isn't official for the UK we hope this comparison has been helpful. Key things to note are that the M9+ has a more impressive 5.2in screen with a Quad HD resolution, the Duo Camera setup and a fingerprint scanner. It seems like HTC's sticking with its tried and tested designs and playing it safe with the One M9, and while it's a great looking handset with enough grunt to compete with other leading flagships, we do wish HTC would take a few more risks and go with something completely new. There's nothing too wrong with the M9, it's just that it feels like more of the same. Again. Let's just hope HTC has something completely fresh under its sleeve for next year. In other news, it’s great to see HTC working its way back to health. The company has reported profits in recent quarters, and with the One M9, it’s easy to see that the firm is firing on all cylinders again. This phone has a lot going for it: looks, power, battery life, a nice display, and another helping of power. Despite having a theoretically lower storage capacity and costing £20 more than the One M9, the Galaxy S6 is the clear winner of this head-to-head review. Featuring a top-end display, super slick processor and wealth of security and productivity services, the Galaxy S6 is one of the best Android smartphones available to businesses. 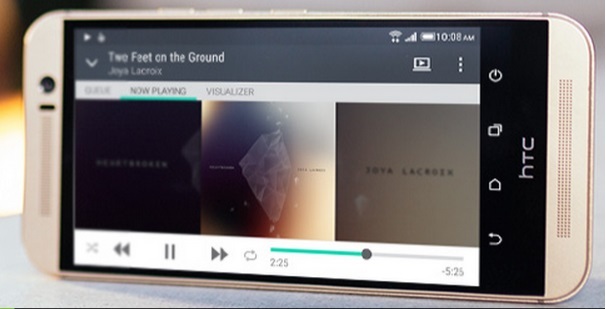 HTC hasn’t completely left the design alone, however. Although it has the same, gently curved rear panel as its predecessor, it no longer wraps smoothly around the sides of the phone. Instead, the M9 has defined edges, flattened sides and a step between those edges and the front of the phone. If you don't care about cutting-edge pixel counts, ultra-light and thin builds, bigger screens or novel new features – and you just want a solid all-around phone with a sharp-looking design – then the understated One M9 is still worth a look. Just do yourself a favor, and look at some of its rivals as well. We can't help but think HTC made a big mistake by taking baby steps forward just as Samsung, Apple, Google and others slammed their feet on the gas. Overall, further testing of the One M9 basically confirms my fears, which were that the One M9 is effectively a sidegrade of the One M8 at best. I really did want to like this phone, as I still find the One M7 to be a great phone to use. I really wanted to see a phone from HTC that was worthy of an upgrade from the One M7, but the One M9 isn’t that phone. The M9 just isn’t unique enough to command the current premium. But then a) many people will be getting this on contract, in which case the costs are somewhat obscured, and b) HTC has hedged its bets by producing that aforementioned ‘One M8s’, which is, in many ways, a very similar device, yet priced more realistically, so maybe it’s a case of a design for every wallet? If you've ever struggled picking between two great flagships in the past, you'll likely know what we ourselves understand all too well – when you're looking to make the most out of your hard-earned cash, choosing can be difficult. Fortunately, with the Samsung Galaxy S6 and the HTC One M9, things are clear-cut enough for you to simply have to identify what's important to you personally – the answer will then come to you naturally. Make no mistake: This is still a very good phone, and the rating above reflects that. It's just not an exciting upgrade, particularly if you're coming from the M7 or the M8. The One M9 will make a fine phone for the fashion-conscious, but that's no longer enough to carry it past the fierce competition. HTC One M9 vs. Samsung Galaxy S6: Which Android Flagship Is the Best? In a perfect world, my ideal Android device would consist of HTC’s hardware, Samsung’s camera and Google’s stock Android OS. But alas, such a thing does not exist. So where does that leave us? Like the others before it, the HTC One M9 is a solid Android device, and it’s still one of the best-designed phones, regardless of operating system. But the minor changes and sub-par camera make it hard to recommend as an upgrade to the One M8 and the new Galaxy S6 devices. The One M9 is a very good phone, and with the new camera HTC at least improved its most glaring flaw. Lots of people will be very happy with this phone. But the thing I used to love about the One was that it was special. It looked special, it felt special. It’s not special anymore. The One M9 is a good phone, but it’s only that: good. From both a hardware and software standpoint, this feels like one of the best phones of 2014, not a contender for the best phone of 2015. You wouldn’t be bad off buying one, but you wouldn’t really better off than buying last year’s model. That's painfully faint praise for a flagship phone. Samsung and HTC are inseparably entangled with Android and the platform proved a major driving force for the rise in fortunes for the two companies. A lot of that was on the back of flagships - despite being the priciest gadgets in the lineup, Galaxy S and One flagships have drawn massive amounts of interest that subsequently translated into sales. Is the HTC One M9 iterative? Yes. Does it lack the flash of a curved display or fingerprint sensor or other gimmicks found in competing Android flagships? Yes. Is that necessarily a bad thing? The One M9 puts design above all else, and in that respect it could still be crowned the best on the market. With strong hardware and improved software, the One M9 makes a case for the best overall Android device, as well. Smartphone cameras are a big deal for all users. It's the camera you always have with you. A high-end flagship phone doesn't have to have a ton of new gimmicky features, but it does need to take photos and videos that look great, in a wide variety of conditions, with minimal effort. The One M9 camera would have been considered impressive a couple of years ago, but in 2015, it just doesn't compare with other flagship phones. The One M9 is a striking and attractive design, and I’m glad it hasn’t changed it substantially. But it’s a brutally competitive market and HTC can’t count on Apple and Samsung’s complacency any more: both leaders have raised their game. Hopefully HTC can improve the image processing, pronto, and maybe even lose its tacky widget, so it can stay in the game for another swing at the market. The HTC One M9 is a phone that takes the design heritage, DNA and all the other good bits of last year’s phone and, well, does them again. It’s again shown the rest of the competition how to make a premium smartphone, and if it can iron out some of the wrinkles around battery and speed, it’s another great phone – but the competition is catching up quickly. As with every One flagship, HTC has created a good phone with the M9, it offers a balanced overall experience and plays to its strengths in design, battery longevity and usability, but good might not quite be enough for those laying down the notable amounts of cash such handsets demand, even on a two year plan. We like the HTC One M9 a lot, we just haven’t fallen in love with it this time around. The HTC One M9 may not feel like the most original or innovative of smartphones, but it does manage to tick all the important boxes. An elegant metal design, top-end octa-core processor and upgraded rear camera, plus the business benefits of Android 5.0 Lollipop, make the One M9 a solid choice for any business buyer. What we are sure of is that the HTC One M9 is stylish yet safe. It’s still an excellent phone, and there is a lot to admire about what HTC has made here, but if you’re looking at the new handset and expecting an evolution, a revolution, and more of that panache HTC has brought for the past few years, you’ll get some of it, but not likely all. For the first shot in the 2015 smartphone race, there’s certainly a lot to like here, and customers will likely love just how well made and finely tuned the One M9 is, but there’s more to come, and we think HTC could have done a little to make it a little more remarkable, rather than being merely memorable. The One M9 holds HTC's course. The One M8 was already the best-looking Android phone on the market, with terrific front-facing speakers, attractive themes, and an unfortunate camera. The M9, at least the one I'm looking at right now, appears to be more of the same. Pricing, though, favors the HTC One M9 whatever route you decide to go with – whether it’s with a contract or buying outright. Here in the US, the M9 will more than likely require you to dish out $200 with a 2-year contract, which is the usual price attached to most flagships. As for the Note 4, however, you’ll pay more at $300. Despite the $100 difference in price, it’s something we’d happily pay for because the Note 4 is such an incredible smartphone packed with solid performances and rich features. The HTC One M9 is the third iteration of the HTC One, coming from strong stock: we loved the M7 and the M8, with both devices delivering premium build and a metal body that was unmatched. However, while the HTC One M9 offers plenty to love, it doesn't really move forward. As a flagship device it's very well put together, and sticking to a 5-inch display makes it one of the smaller and more manageable devices. That display is sharp enough at Full HD, although on our review device, not as punchy as the M8 we've been using over the past year. BoomSound speakers also continue to be best in class. With the M9, it seems as though HTC heard the feedback from HTC One M8 owners and addressed all the concerns. The HTC One M9 has a good grip, the camera has been upgraded to take great pictures and the battery life should easily last a day. In short, HTC has made an excellent phone even better. So is the HTC One M9 a winner? We'd love to be say "yes" unconditionally, but we'll have to qualify it a bit. Yes, the One M9 is a clear champ for the HTC camp, especially HTC One owners. It addresses many of the complaints that One M7 and M8 owners had and lavishes premium craftsmanship for those who are already fans of its design. In short, the HTC One M9 is perhaps the best fan service that the manufacturer can give. Note that the images in the gallery below are presented without captions. For the comparison photos, you will find the M9 in the upper left, Sony Xperia Z3 in upper right, HTC One M8 in lower left, and Apple iPhone 6 Plus in the lower right. For the photo with two images, the M9 is above the 6 Plus. Check out the camera data shown at the bottom of my Flickr album for details when looking at those images. Latest Snapdragon, latest Android and Sense, Dolby Surround added to HTC Boomsound, very good screen quality. With a proper camera finally on the list, the HTC One M9 is the all-round flagship smartphone the company should have had a while ago. The beautiful aluminum unibody looks as good as ever though and, if nothing else, the two-color design adds an extra bit of flair. It doesn’t blow the best phones of last year out of the water, but the M9 is still the best phone around right now. Having said that, if you’re looking to upgrade soon you’d be wise to wait for this year’s competition to arrive. The Samsung Galaxy S6 and LG G4 will be with us any time now, and they promise to give this classy, metal-clad flagship a real run for its money. It might sound maudlin, but I really wanted to love the One M9 as much as I did the One M7. This seemed like the year HTC would nail it again. They came close! I'm still surprised that it's Sense that I'm most impressed with. BlinkFeed is a first-rate time sink, and theming is a lovely, awfully personal way to kill a few minutes and make your M9 really feel like yours. The One M9 smacks of HTC playing to the HTC faithful: a device that’s designed to answer the lingering complaints of current users, and play up to their design tastes. On that level, it does very well. Viewed as part of the smartphone spectrum in 2015 as a whole, however, and the strategy feels myopic. There's none of the goofball appeal of the HTC RE camera, for instance, which while wacky is at least memorable. In short, I’m not entirely sure there’s enough to the HTC One M9 to address what has long been HTC’s biggest issue: clawing enough attention out of the gate from its well-heeled, well-marketed rivals. At the end of the day, the HTC One M9 is a great smartphone. With an awesome design, top notch performance, great software and an improved camera, it should suit most users just fine. But at the same time it no longer sits at the top of the flagship smartphone pecking order. HTC’s competitors have doubled down on areas where the One M9 isn’t as strong, making the choice of what high-end smartphone to buy a whole lot less clear than this time last year. Let me make one thing clear: the HTC One M9 is an excellent phone, filled to the brim with good features, a clever interface and a design that it should rightly be proud of, once again showing every other brand how it should be done. The issue is that it doesn't improve enough. The One M8 was pretty much the perfect phone, and not much has changed year on year… in fact, HTC has gone backwards on battery life and hasn't really done much more than polish throughout the phone. HTC’s new One M9 is a strong offering from the scrappy Taiwanese company. It’s the strongest phone HTC has ever made. The hardware is sleek, the performance is smooth, the power is there and it has been improved in almost every way compared to its predecessors. One year, that’s the typical cycle a company needs in order to make the necessary adjustments in making a new phone better than the previous one. As we take a look at the bigger picture, we certainly can agree that the HTC One M9, as a whole, has been tweaked and refined to correct the issues that were left outstanding with the M8. Visually, there are subtle changes to the design of the M9, but at the end of the day, it commands respect for continuing to be one of the best designed phones out there – more so when it embodies the qualities we want in a high-end product. But only M8 owners care about the first thing, and only phone geeks care about the second. For the regular Joes and Janes shopping for an Android phone, the One M9 still stands out amid a sea of plastic-clad rivals. Its metallic fuselage catches the eye, and going hands-on is like a firm handshake: reassuring and not soon forgotten. The M9 is for these folks – people who haven’t owned an HTC phone before. Like an S-model iPhone, it’s meant to be familiar rather than groundbreaking, accessible rather than revolutionary. It’s no Porsche 911, and it’s certainly not going to propel HTC to new heights all on its own … but it is, for now, a worthy custodian of the company’s iconic smartphone legacy. Samsung Galaxy S6 vs HTC One M9 comparison: Which is the best new phone for 2015? HTC has traditionally launched some of the prettiest Android phones, but Samsung has turned things around with its all metal and glass, Quad HD Samsung Galaxy S6. With a better screen, a faster-clocked processor and some extras such as a fingerprint scanner and heart-rate monitor, you might assume the Galaxy S6 is the better deal. However, until we've finished our full lab-testing we are unable to comment on such things as raw processor- and photography performance. Check back soon for our verdict. The M9 is extremely responsive, the display still looks fantastic, BoomSound speakers perform well, and the improvements in the design are easily worth an upgrade from a M7. If you own a M8, upgrading to the M9 may be harder to justify and I will have to spend more time with the M9 to make that determination. The HTC One M9 is the sort of phone that we expected the brand to make, hitting the right marks without wowing in the same way rivals are this year. That's almost to be expected though, as brands like Samsung, LG and Sony are all going to up their game to stay relevant in the smartphone market, rather than letting HTC and Apple run away with the premium design awards. With the release HTC One M9, the Taiwanese manufacturer played it safe this year with this highly elegant but unsurprising device. The camera has been improved with a 20.7 Mp sensor and 4K video, however we still need to compare it to the best camera phones out there to really make up our mind. As you know, Megapixels can help with increased sharpness, but they don’t define photo quality. As you would expect, the HTC One M9 runs on Android 5.0 Lollipop which is the latest version. However, HTC doesn't leave it as is so puts its own skin or user interface over the top. The M9 introduces Sense 7.0 which has some new features. It isn't a huge change from before, however, and the software experience is very much as it was, so in many ways, this is HTC sticking to familiar territory. If you're an M8 owner then you might be tempted to hold off - Sense 7 will probably be coming to your device anyway and there isn't a huge step change delivered by the M9. For those with an M7 the design improvements will be immediately noticeable. Other phones may have more to shout about in terms of futuristic features, but the One remains a great example of gimmick-free design, with a smartly made interface and spanking build quality. It'll be available from 31 March and we'll hopefully have a full review of it well before then. Taken together, Sense 7 looks as though it's going to be a vast improvement on Sense 6, and we can't wait to try out some of these new features for ourselves once we get our hands on a final review sample. While the One M9 itself isn't quite as an exciting or innovative handset as its predecessor, there's no denying it's still one of the best-looking handsets out there and Sense 7 should make it easier to use and generally feel a little smarter when you're out and about. We'll bring you our final verdict in the next couple of weeks. The smartphone industry is right now at a stage everyone's making incremental changes to their products, and HTC is no different. While there are question marks around Snapdragon 810's real world performance and the One M9 lacks some features that competitors offer like optical image stabilisation and a fingerprint scanner, in addressing M8's design niggles and making a move away from UltraPixel technology for the rear camera, HTC has demonstrated a willingness to listen to its customers. We put on the HTC Grip smart band even though we're not the mid-level and pro athletes that HTC targets with this device. We're pretty impressed that the company managed to keep this project a secret in the day and age of all-encompassing leaks, though we're not exactly floored by the actual device itself. 86% Kaufen oder auf das M9 Plus warten? Qualcomm Adreno 430: Adreno 430 - быстрый мобильный графический чип для смартфонов и планшетов. Они позволяют запускать некоторые нетребовательные современные игры. Впрочем, производительности данных видеокарт более чем достаточно для обычных офисных задач и просмотра HD-видео. Плюсом интегрированных видеокарт обычно является наибольшее достижимое время автономной работы использующих их ноутбуков. 810 MSM8994: Qualcomm Snapdragon 810 (MSM8994) - производительный процессор ARM с восемью вычислительными ядрами, представленный в апреле 2014 года.